All astrolabe-clocks incorporate an hour, minute and second hand to give the exact time of day. Gizeh's astrolabe does this also, but on a solar scale. 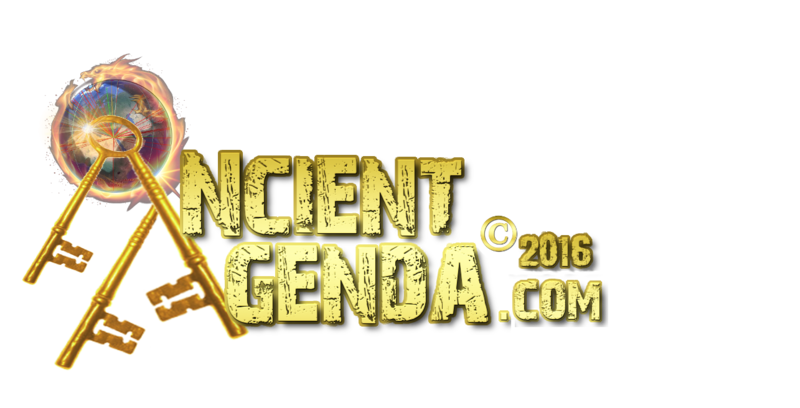 The Great Pyramid uses three exclusive astrological events to construe this message. 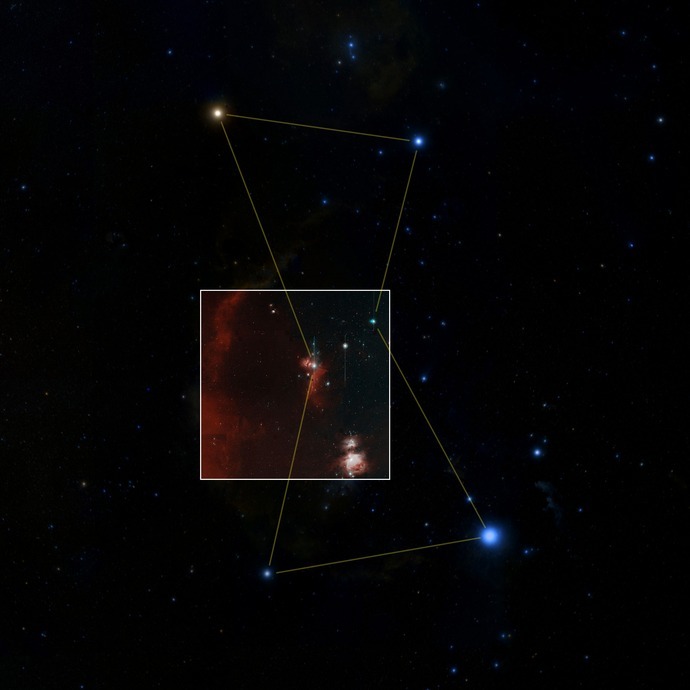 Due to the oscillation of Earth, the Orion constellation appears to start at one of the ecliptic horizon, cresting the heavens landing upon the other side of Earth. Orion can be seen from both hemispheres and is the world's oldest star-system used for night-time guiding travels. The Great Pyramid uses the Orion 26,000 year transit to mark the intervals of this lengthy calculation, from beginning to end, and rebirth of that cycle. The Solar Equinox interval, that equals a division of day and night as near perfect as possible, is also used by the Great Pyramid to conduct a yearly solar message. During the twice-yearly Equinox event, the Great Pyramid's eight-sides are revealed as it's facial shadows of light and shade are quadrants by the geometric shaped sides which 'consumes' light into shadow. The Orion 26,000 year transit is almost identical to Earth's Equinox Great-Year calendar of the same time length. The reason both Orion's count and Equinox Great year have been used in the Great Pyramid's message, is to show the Clock Work of the solar heavens. Orion is the 'full-clock count'. Equinox is the 'hour-hand' for the clock. Solstice twice yearly is used as the astrolabe's cosmic clock's 'second-hand' motion. The calculated message gives us the day of the cycle, (the zodiac age) the hour (which would then be the calculated year to this cycle), and precisely to the second. "Now you command the Israelites to keep the years in this number—364 days. "A similar calendar has been discovered in some of the Dead Sea scrolls from Qumran. A 364-day calendar is useful from the perspective that the number of days in a year is divisible by 7 (52 weeks = 364 days). Every date in the calendar is therefore anchored to a specific day of the week, and does not change from year to year. The Jubilees calendar is further divided into four quarters, each of which consists of 91 days (13 weeks of 7 days), and since this number is also divisible by 7, each date in the quarter falls out on set day of the week, without any shifts from quarter-to-quarter or year-to-year. Each quarter in the calendar begins on Wednesday, the day of the creation of the heavenly bodies relevant to time keeping (1:14-19). Every quarter throughout history is identical, consisting of two months of 30 days and third day of 31." It should be noted the time-length is given from the Gospel of Jubilee, known as God's Time-Line. all equally spaced in 13 week time allotments. Multiplied by Four (13x4) equals our 52 week solar year calendar. God's perfect 364 day Year equals 3+6+4=13. This has been termed 'Codex 13'. Along the roads of ruins researching our mysterious history and those explaining it from their particular view, many have come across the research of Carl Munck. His work details a mathematical geodesic calculation of a past advanced global civilization. Although his work offered a very interesting perspective, it became apparent he had missed what all the other historians talk about but completely overlook. Regardless of what 'documenter' explains our global megaliths, they all overlook how these archaic monuments expel a codex to the Prime Number Th1rt3en. The mysterious China pyramids: the furthest inland pyramid known as the Lianhu 'Altar' coordinates are 36.632869°N & 101.746123°E. Adding these coordinates together equals 138 and a direct reference to the global Codex 13 message created from the Great Pyramid clues. Using Google Earth for it's measuirng tool, drawing a line from the North-west side of the Lianhu-Altar takes you directly to the Great Pyramid. Many of China's pyramids mirror in geodesic shape and math the Great Pyramid of Giza. Stonehenge; geo-coordinates 51°10'43.84N & 1°49'34.24W reference Great Pyramids South and North slope angles plus 'mean distance' between Earth and our Sun. West coordinate is 1°49'34.24W and our astronomers calculate the 'mean' distance between our Sun and Earth in 'approximation' at 149,597,871 km. The distance between Stonehenge and the Great Pyramid is 3,600 Kilometres referencing a 360 degree circle ratio. Stonehenge has 76 Trilithon stones (7+6=13) There are 95? standing-stones. Each standing stone was around 13 foot (4.1 metres) high. Uffington White Horse is laid out on a hilltop to reference the horizon, this diagram stretches 360 feet in length giving us a running circular dimension referring back to the Great Pyramids alignment of 3.60tieth of a degree off true North sequence. 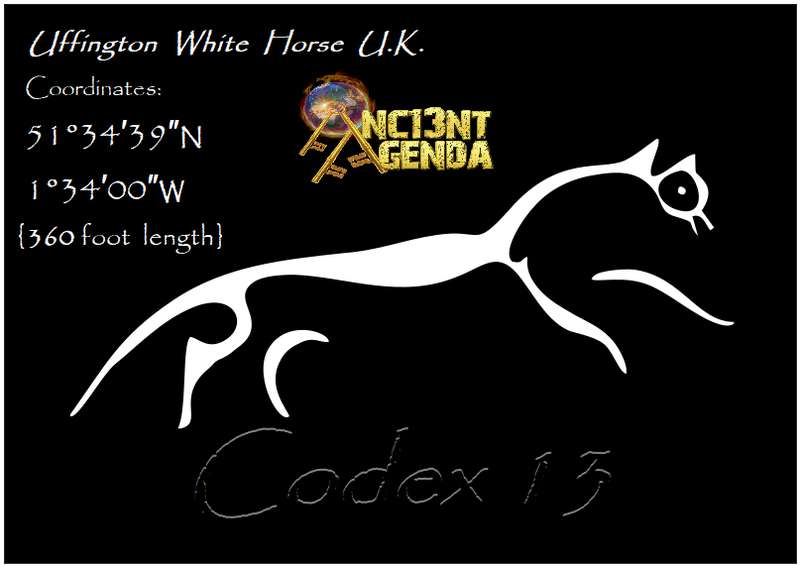 Noting the 'West' geocoordinates reveal the Codex 13 method; that 134 adds to 8 is a hint to a reflection of Imperial math mirrored in Metric. This Imperial Metric mirrored math is vaulted and exemplified at the Great Pyramid location situated upon 13 acres, built with 8 sides. Historians and mathematicians have documented each 'side-slope angle' to the Great Pyramid's cardinally directed corners, slightly differs from each other. Is the Uffington Horse 'North coordinate' hinting at the Great Pyramids North-West side-slope angle, when it was once covered in White Tura limestone that shone as distinctly as the Uffington Horse still does today? Uffington's coordinates note the Great Pyramid's North-west angle and sequences the Prime Number 13. 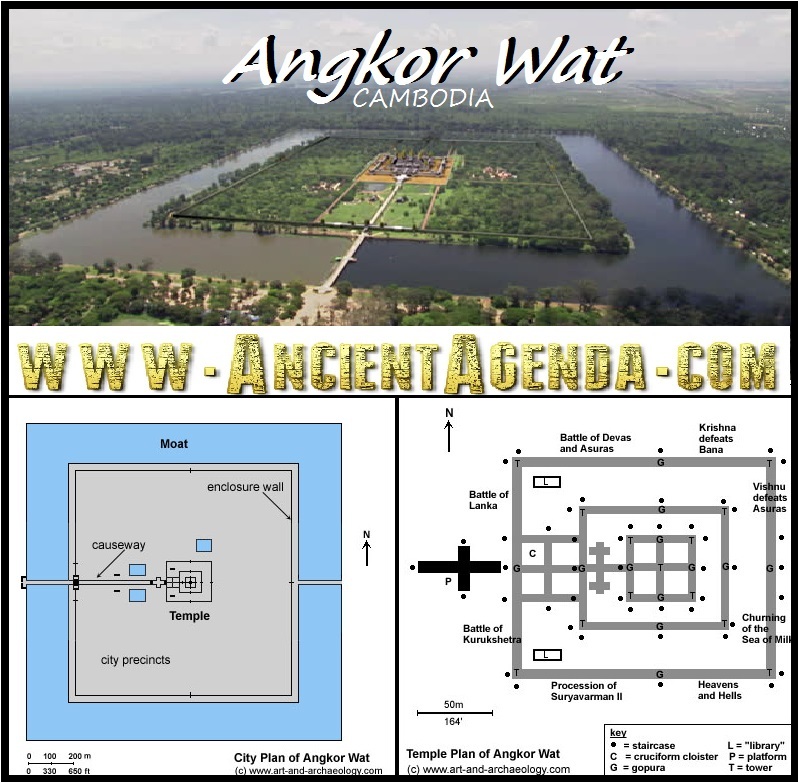 Angkor Wat built with it's center tower 130 feet tall revealing our solar system in geomathematics, built at precisely 13 Latitude and 103 Longitude is enclosed by a moat 1.3 miles long per-side and 13 feet deep. Both Africa's 13 rock hewn churches of Lalibela and South America's 13 rock sanctuaries of Chankillo separated by 13,184 kilometres exemplify advanced astronomical knowledge. Combining both Lailbela's and Chankillo's coordinates equals 138.5115 and another clue to Codex 13. Chankillo conducts use of Solstice-Equinox while Lalibela is undetermined. 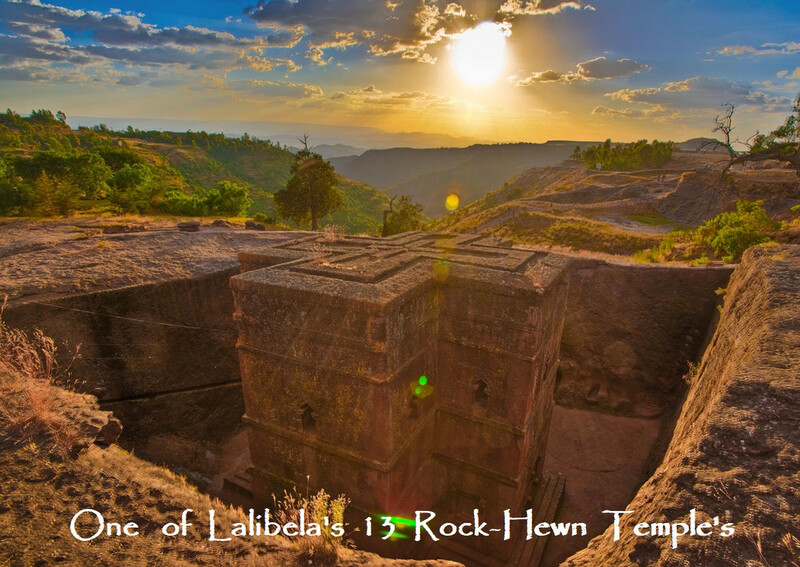 The rock-hewn temples of Lalibela are created with geometric astronomical symbology. 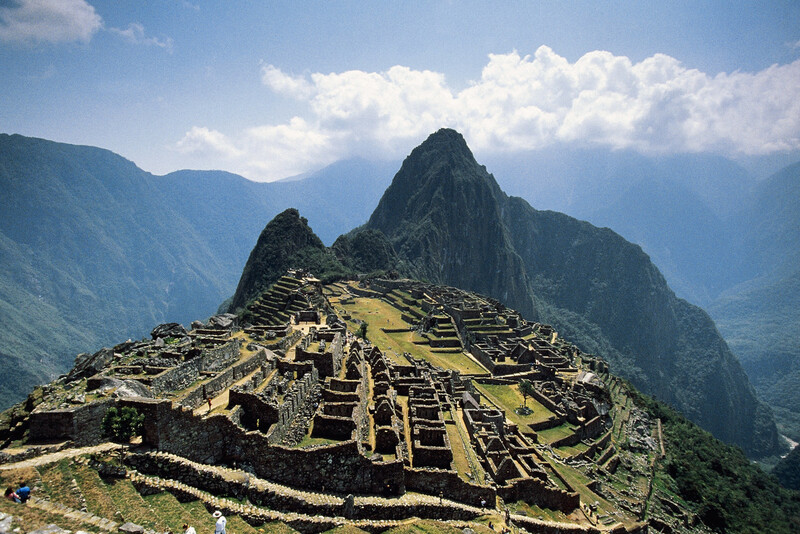 Machu Picchu covers an area of 13 square miles. The 'Hawks-Nest' overlooks Machu Picchu by 135 meters. The Geo-coordinates register 13 and 72. The number 72 is how many years it takes for Earths zodiac view to move one-point over the heavens ecliptic horizon. 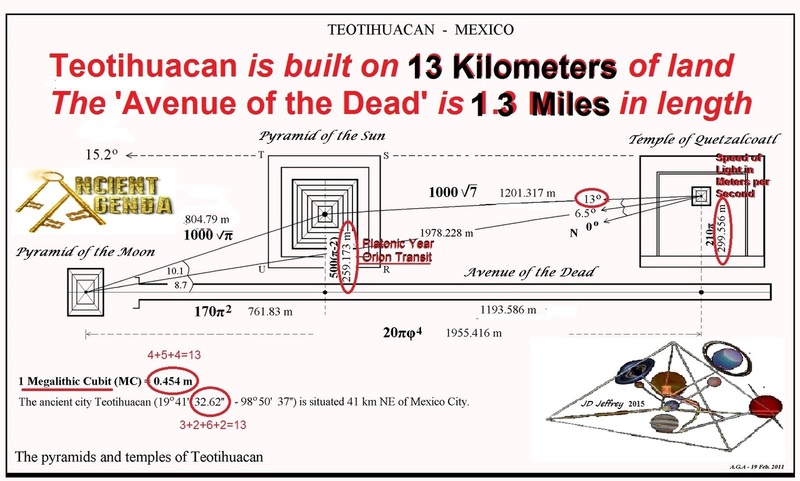 Teotihuacan's West Longitude combined with the Great Pyramid's East Longitude equals 129.5842, 'rounding up' to 130 revealing Codex 13. 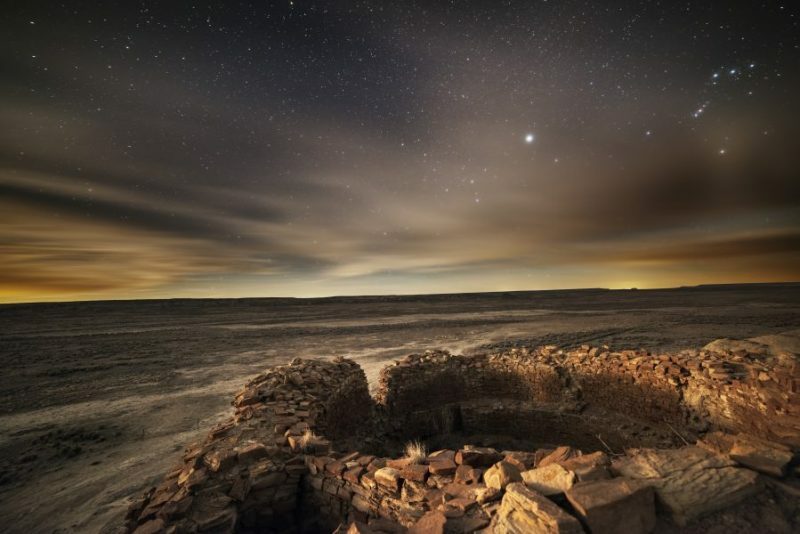 Chaco canyon's 13 Ghost Towns stretched over an 8 mile area exemplify advanced astronomical knowledge. Geo-coordinates reference 36.06°N & 107.97°W reference 36 North as a 360 degree ratio while 107.97 West 'rounded-up' equals 108. This number 108 signifies our Solar System; one Sun and eight Planets total 9. Geocoordinate of 36N is also the sum of 9. 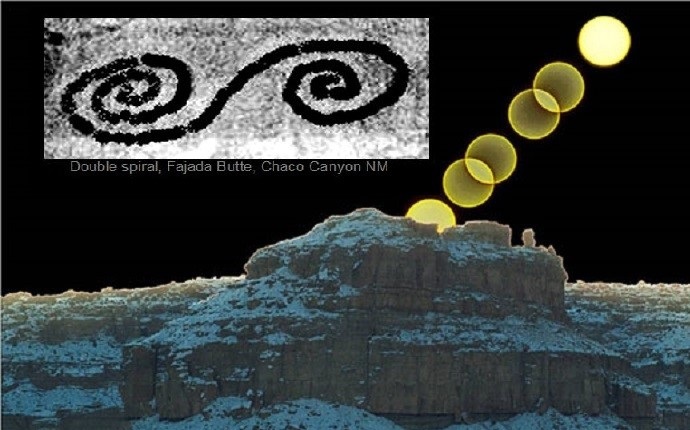 The Sun-dagger serpents of Fajada Butte's Sun-Dial situated above the valley floor at 135 metres, hints to the distance between Chaco's 13 ghost-towns and Ohio's 1376 foot Serpent Mound, calculated in distance between the two at 1358 Miles. Ohio's Serpent Mound's total length is 1,376 feet. This effigy's height ranges from one foot to three feet, signaling out the numbers 1 & 3. Geo-coordinates 39°01'35N & 83°25'51W reference 39 as a Metric Metre and West coordinate added up equals 24; the amount of regulated hours in a solar day. ‘13 is the most enigmatic of all numbers, as it is the number of transformation." 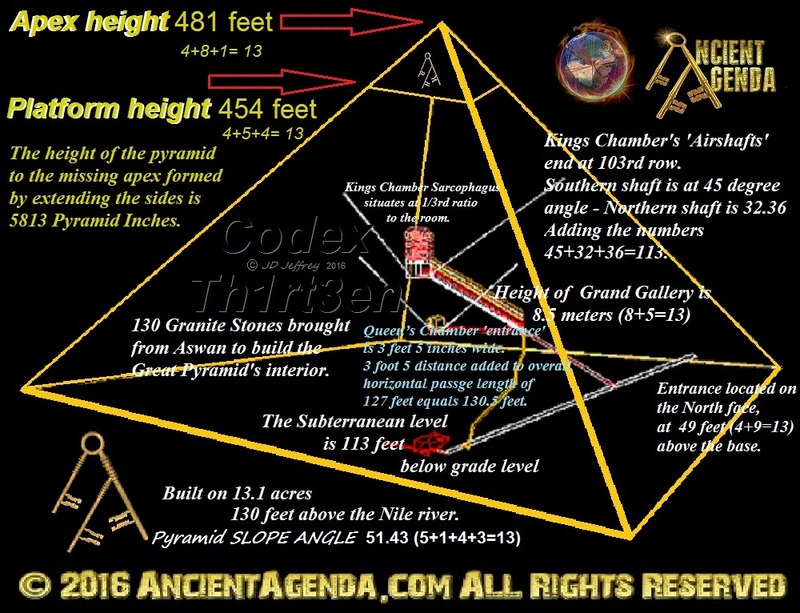 Giza's Great Pyramid is built on 13 acres with a height of 481 feet detailing 4+8+1=13. Full base length of 3024 feet plus 481 height equals a total of 3,505. Only 130 Granite stones can be seen inside the pyramid. Subterranean Chamber resides 113 feet below grade-level. There are only 13 full stones in the Queens Chamber floor. The Grand Gallery measures 8.5 meters tall equaling 8+5=13. The Kings Chamber 'sarcophagus' sits at a 1/3 ratio to the room. The highest air-shaft exits the Kings Chamber at the 103 row of stone. The Great Pyramid sits above the Nile River by 130 feet. 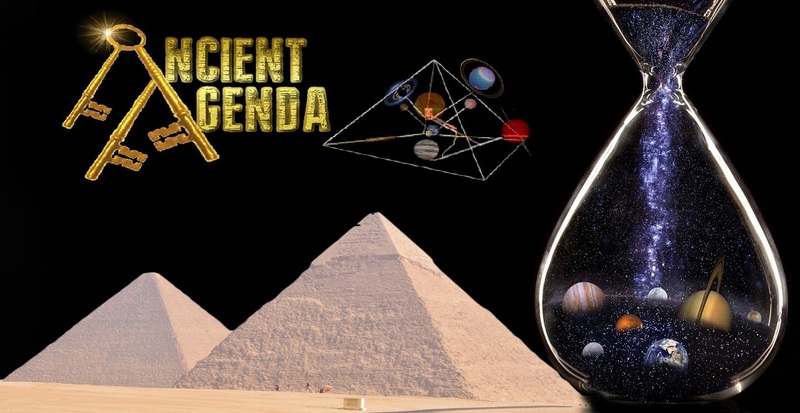 The Great Pyramid's Geo-coordinates added together equal 60; Coordinates:29°58'45N & 31°08'04E, which reveals beyond a shadow of a doubt, our planets continents have not shifted. 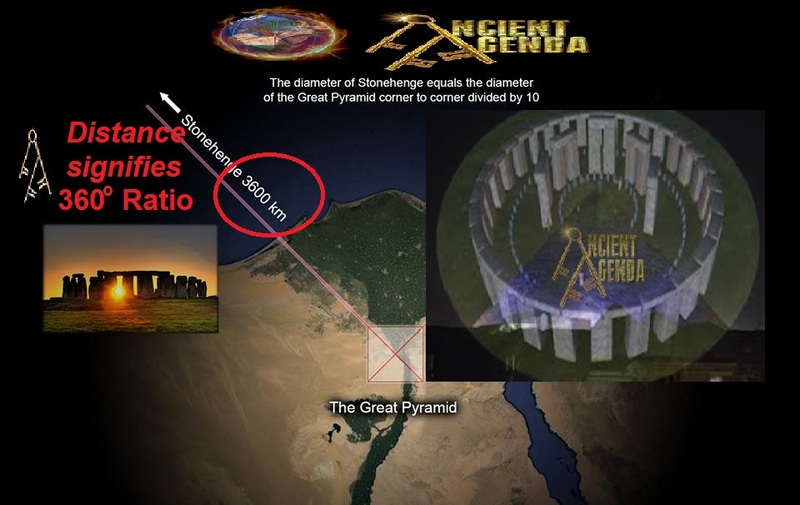 The geo-coordinate location reveals the Great Pyramid's location within Earth's coordinate grid system detailing the Speed of Light in a vacuum per Metric math; an advanced knowledge mathematically incorporated in it's specific build location. "In the mystic teachings of the Hebrew, there are thirteen aspects that make up the body of God. There are thirteen Sephiroth in the Tree of Life, the Thirteenth realm being that of Ain, which is the unmanifest, yet all-potential aspect of God." Our modern cartographers, following a mathematical precision to disect the planet into a readable and understandable mapping system, inadvertently or advertly, are using an ancient grid system designed by those who walked this planet before. 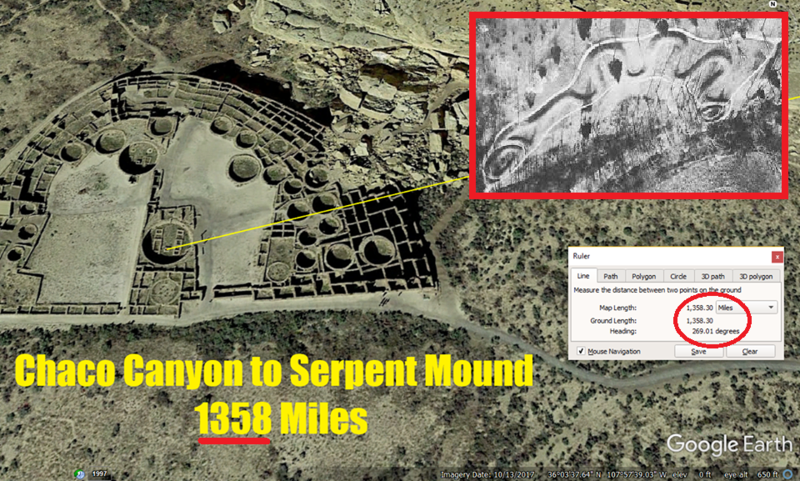 With so many archaic megaliths directed towards Solstice-Equinox plus Lunar cycles, using andvanced acoustics, there is no accident these monuments align to our present day Longitude/Latitude grid-pattern. Time has allotted a glimpse behind the veil. 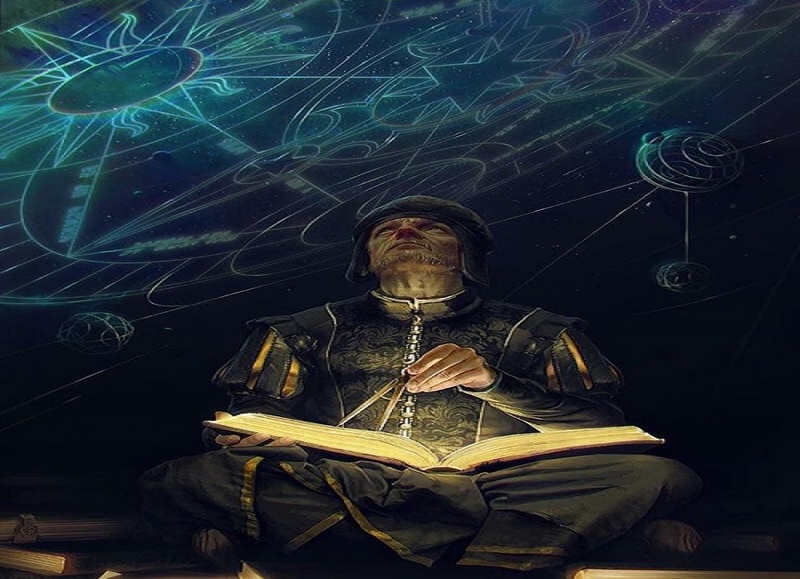 Through the knowledge from the God's of yesteryear, those who created the wondrous Tower of Babel; what was once ordained to them, is now ordained to our mortality in the same allotment of time to our Earthly heritage, as the Gizeh Astrolabe concedes. Should we not pay homage to our Grandcestors, and celebrate these magnificent messages of jubilee clothed in golden Sun-rays, which had so long ago been bestowed to us for a time when humanity glorifies and restores our unified history in a modern dignified age? Rise Up- we have been waiting for us.